The current exhibition at the Embassy of Japan looks at the beauty and functionality of washi 和紙, hand-moulded Japanese paper. It is prized for its strength and beauty. It is made from natural materials and the clean water of Japan’s rivers and streams. It has been favoured by calligraphers and printmakers for its porosity and fine texture. Its translucence and durability have made it the perfect material for the making of paper screens (shōji 障子) and sliding doors (fusuma 襖), lampshades and other household items as well as umbrellas and even raincoats. 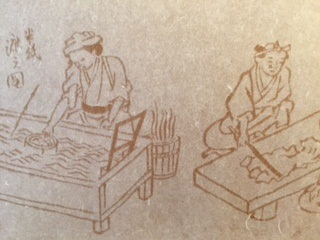 Textiles made of hand-spun paper yarn are called shifu 紙布. The fibres in washi are longer than paper made from wood pulp, and these are what give it its strength. It is made principally from the bark of kōzo楮 (paper mulberry), ganpi 雁皮 or mitsumata 三椏, three shrubs which occur naturally in most parts of Japan. 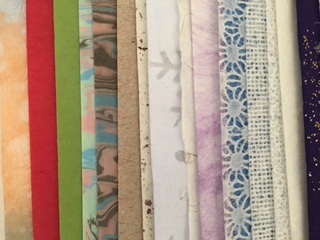 This exhibition shows how paper is made, the variety of Japanese handmade paper and a brief history through colour, texture, decoration and form, and the works of two artists, Elaine Cooper and Mayumi Kaneko, who use washi in their work and a selection of works which use washi from Mino in Gifu Prefecture. Elaine is a leading expert on washi and an artist and designer who, having learned from papermaking craftsmen in Mino, makes artworks from her own paper, sourcing kōzo fibres from Japan. Her stay in Japan in 1991 proved to be a unique and enduring collaboration. Mayumi, who was originally a kimono designer in Tokyo, came to the UK in 2003. She has an interest in textiles and her works use yarn made from paper and is ever exploring its potential. Having been made aware of the beauty of Japanese use of colour and design while in Japan, Mayumi’s current works are inspired by this and her everyday surroundings in the west of England. Washi is made all over Japan, but in 2014, the craftsmanship of Japanese paper in three communities – Mino in Gifu, Ogawa/Higashi-chichibu in Saitama and Misumi in Shimane – in Japan was inscribed on UNESCO’s list of Intangible Cultural Heritage of Humanity. The exhibition WASHI - PAPER: Japan’s Handmade Paper is open until early July 2015.